The all-new Survey of Best Practices in Pursuit of NIH SBIR & STTR Grants provides a rich set of best practices and data to compare against your own strategies in pursuing NIH SBIR and STTR grants. This survey report is jam-packed with dozens of easy to scan charts and figures displaying critical data you can’t find anywhere else. See how your organization compares and identify key areas for improvement! Unlike any other available resource, Survey of Best Practices in Pursuit of NIH SBIR & STTR Grants provides you with an in-depth look into key data so you can compare your practices and see how you stack up against other research universities – and use the data to pinpoint your areas for improvement. 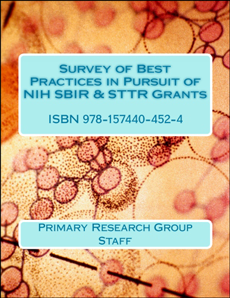 Survey of Best Practices in Pursuit of NIH SBIR & STTR Grants is available to purchase for the low price of just $295, and is available in print or PDF. You can also make this invaluable resource available to your entire staff with an economically priced site-license purchase – just $375!